The light emitting diode (LED) bulb is an energy saving alternative to other light sources commonly used in poultry production. In this article from Mississippi State University's MSU Cares project, researchers explain how to get the best out of LEDs for your farm. The development and refinement of LED technology to meet the lighting needs of the poultry industry over the past 5 years has been a remarkable feat, write Mississippi State University Extension Professor Tom Tabler and colleagues. For the latest research on poultry health and welfare under different light colours, read last week's feature here. As a general rule, the poultry industry is pretty conservative, and it has taken a while for the industry to become comfortable with LED technology. However, there is enough data available now that the industry is embracing LED technology and the energy savings it offers poultry producers. A good LED bulb is 80–85 per cent more efficient than an incandescent bulb. However, not all LED bulbs are the same, and poultry producers should invest time and do research before purchasing LEDs. Any LED bulb is expensive compared to incandescent bulbs, and you don’t want to make a mistake. Let’s take a closer look at questions you should ask, issues that may arise, and energy savings that can be expected from LED technology. Light is an important environmental factor in poultry production. Light affects production efficiency, animal welfare, and growth rate. The four main features associated with light are intensity, photoperiod, source, and spectrum (Manser, 1996). Colour of light is determined by the various outputs from the different wavelengths that make up the visible spectrum. White light contains all the wavelengths of the visible spectrum, but it differs in colour temperature (kelvin rating) depending on the power emitted from the different individual wavelengths within the spectrum. As a result, light is not only important to the poultry industry, but it’s also complicated. Therefore, as a poultry producer, don’t make the decision to switch to LED bulbs in your chicken houses without asking some important questions and seeking advice from people you can trust. Talk to your service tech to be sure that your integrator will allow you to use LED bulbs. If you can use LEDs, verify from your integrator or service tech which brands are acceptable. Integrators often allow only certain brands of LEDs to be used on their contract farms. Fortunately, several major universities in the US, including Mississippi State, Auburn, Georgia, Arkansas, Maryland, Delaware, and possibly others, have poultry Extension personnel who have worked with LED lighting since it first entered the poultry industry. These individuals have conducted numerous field tests and evaluations on a number of different LED products and can offer unbiased information on cost analysis, payback potential, and life expectancy of various LED products. This information is free for the asking, so take advantage of it and learn all you can to help you make the right choice. If you decide that LEDs are the right choice for your operation, purchase from a manufacturer that has a proven track record in agricultural lighting and understands the lighting needs of today’s poultry industry. The LEDs must be able to provide enough light for baby chicks (2 foot-candles or more at the floor) for the first few days after hatch to help chicks easily find feed and water. However, the bulbs must also be able to properly dim to the very low levels needed later in the flock (0.03 foot-candles or less) to maintain optimum performance. Proper light intensity is critical to bird performance throughout the flock. Request results from field trial studies that can document bulb performance. Was bird performance acceptable? Was bird behaviour affected in any way? Many producers who have switched from compact fluorescent lights (CFLs) to LEDs seem to observe that birds have a calmer behaviour and disposition under LEDs than CFLs. This could possibly be because LED bulbs do not flicker in the same manner that CFLs do. Because of their keener eyesight, chickens are much more sensitive to flickering lights than are humans. The lack of flickering in LED bulbs may have a more calming effect on the birds. To some extent, LED technology is ahead of light dimmer technology, and not all dimmers are compatible with all makes of LED bulbs. This is due, in part, to the fact that, unlike incandescent bulbs that dim in a linear fashion (meaning that, as the dimmer is turned down, let’s say 20 per cent, the light output from the bulb decreases 20 per cent), LED bulbs, for the most part, dim on a non-linear basis. This means the dimmer may have to be turned down a long way before you notice any actual dimming in the light output of LED bulbs. Dimmer manufacturers are catching up rapidly, but there are many older dimmers currently in the field that may need upgrading to properly dim LED bulbs. Therefore, it is extremely important that you verify that your dimmer can handle LED bulbs before making the switch. Determine the kelvin (K) rating of bulb that your integrator will allow. The kelvin rating refers to the colour temperature of the light (warm, neutral, or cool). A warm kelvin rating is in the 2,700K to 3,000K range, with an orange-red color similar to an incandescent or high-pressure sodium bulb. A neutral kelvin is in the 3,400K to 3,700K range. A cool kelvin rating is a blue-white color in the 5,000K to 6,000K range. It appears that the 5,000K bulbs are the most popular LED choice for broilers today, while the 2,700K LEDs are more popular in broiler breeder operations. Again, not all LEDs are the same. A good residential bulb, such as an omni-directional LED, is likely not the best choice for a chicken house. Because of this fact, it may take a higher wattage bulb (usually at a higher price) to get enough light on the floor to meet the needs of the chicks. Many LEDs sold at hardware or discount stores are omni-directional. Therefore, investigate for yourself, ask questions, and learn all you can so that you can make informed purchasing decisions. Even the least expensive LED bulbs cost much more than incandescent bulbs. Be sure that you are paying for exactly what you and the chickens need. Understand foot-candles of light and the importance of foot-candle readings throughout the production cycle. Your service tech most likely carries a light meter to measure the light intensity in your chicken house. A foot-candle is a measure of light intensity on a surface and can help standardise the value of various light sources. A foot-candle is equal to one lumen of light per square foot. A lumen is a measure of the total amount of visible light emitted by a source (the brightness). For example, a 10-watt non-dimmable A19 LED bulb may have a brightness level of 900 lumens. A 6-watt dimmable A19 LED bulb may be rated at 530 lumens. Baby chicks are usually given 2 or more foot-candles of light for the first few days (4–14), depending on the integrator, genetic strain, and nutritional programme. Light levels are usually greatest over the feed and water lines and somewhat less against the walls. It is important to have fairly uniform light levels throughout the house with no dark spots or overly bright areas. 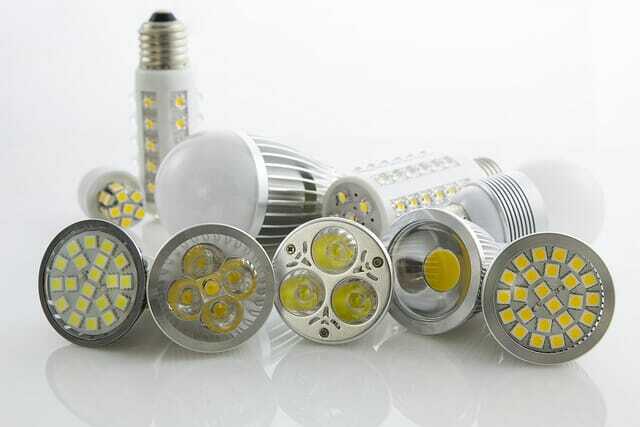 Energy savings associated with LED bulbs are as much as 80–85 per cent compared to incandescent bulbs. This fact has been proven numerous times in field trials across the poultry industry from Texas to the Delmarva Peninsula. The answer is yes - if light levels are adequate during brood and grow periods, if the light dimmer does its job correctly, and if the birds are cared for properly. Birds perform just as well under LEDs as under other typical light sources found in chicken houses. We are currently collaborating with a broiler breeder farm in Mississippi that replaced all its highpressure sodium bulbs on a four-house farm with LEDs almost a year ago. That operation is seeing consistent savings of $1,500 per month on its electricity bill. Production parameters on the current flock under LED lights, to this point, are comparable to previous high-pressure sodium light flocks. The farm is using Overdrive 10-watt 2,700K A19 non-dimmable bulbs on 10-foot centers in two rows of lights above the nests (Figure 1). It also has two rows of lights above the slats between the nests and the cool cells that run the length of the cool cells on 5-foot centers (Figure 2). Again, the pullet and breeder folks tend to prefer the 2,700K range, while the broiler folks prefer the 5,000K bulb. However, a recent USDA study using broilers grown to heavy weights under three different LED light sources (one brand of 2,700K and two brands of 5,000K bulbs) and incandescent light found no difference between light sources on blood physiological variables. This indicated that the three LED light sources evaluated may be suitable for replacement of incandescent light in commercial poultry operations to reduce energy cost and optimize production efficiency without inducing physiological stress on heavyweight broilers (Olanrewaju et al., 2015). There are several LED manufacturers that currently have bulbs of various kelvin ratings in place in Mississippi poultry houses, including Luma Vue, ONCE Innovations, Overdrive, Verbatim, and possibly others. The poultry science department at Mississippi State University has two commercial broiler houses and operates as a contract broiler grower for a Mississippi poultry integrator. This allows the department to conduct applied research on various products of interest to the poultry industry. With permission of our integrator, we have been monitoring flock performance under LED lighting for over a year in these houses. We have been using Overdrive 23-watt 5,000K CFL brood lights and Overdrive 8-watt dimmable 5,000K A19 grow lights. Our flock performance results for four flocks during the past year are listed in Table 1. Performance for flocks 1 and 2 was near average for the weeks the flocks sold. Performance for flocks 3 and 4 was above average for flocks sold those weeks. Currently, lighting efficiency improvements appear to offer the best opportunity for energy savings in the chicken house. Therefore, we continue to investigate ways to improve energy savings related to poultry house lighting while maintaining flock performance. Recently, and again with permission of our integrator, we replaced the 23-watt CFL brood lights with Overdrive 10-watt non-dimmable 5,000K A19 LED brood lights. The foot-candle readings for light levels at various locations throughout the brood area of the house are listed in Table 2. Light uniformity across the house appears to be very good; we will be monitoring flock performance in the coming months using LEDs as both the brood and grow lighting source. The federal Environmental Quality Incentives Program (EQIP) and local utility rebate programmes are available in the US to help producers replace their incandescent bulbs with energy-efficient LED bulbs. Consider taking advantage of these if possible. However, in many cases, the waiting list is long, and, once you sign up, it may take a while for your name to work its way to the top of the list. Qualifying for the rebate program may also require an energy audit of your farm, which will be an added expense. As a result, more and more producers are choosing to replace their bulbs themselves and start saving money now instead of waiting on rebate money to become available. This can be a wise move in the long run because, even without rebates and even if you buy the LED bulbs yourself, LED bulbs will pay for themselves in energy savings alone in a year or less. In addition, most LEDs come with at least a 3-year warranty and several brands now come with a 5-year warranty from the manufacturer. Within the poultry industry, LED bulbs offer remarkable energy savings to producers while maintaining flock performance. However, “buyer beware” is sound advice that you should heed if you are considering switching to LED lighting. Talk to your service tech or integrator before making any type of lighting change. Most integrators today are comfortable with some, but perhaps not all, brands of LEDs. Make sure your integrator will accept the brand of LED bulb you are considering. Omnidirectional LEDs may not be the best choice because they direct too much light to the walls and ceiling, and most of this light (along with the energy it took to produce it) is wasted in a poultry house setting. In a poultry house, most of the light needs to be directed to the floor (not the walls or ceiling) because that’s where the birds are. Choose a bulb that is competitively priced, can withstand the harsh environment, is compatible with your light dimmer, and can deliver the light levels you need during both the brood and grow periods. This is likely not the least expensive bulb on the market, but it need not be the most expensive bulb, either. Ask questions of your integrator, other growers who have switched to LEDs, and university/Extension personnel with LED lighting backgrounds. These folks can help you make informed decisions on what will work best for your operation. Authors of this piece were: Tom Tabler, Extension Professor, Morgan Farnell, Associate Professor, and Jessica Wells, Extension Instructor, Poultry Science. Olanrewaju, H.A., J. L. Purswell, S. D. Collier, and S. L. Branton. 2015. Effects of color temperatures (kelvin) of LED bulbs on blood physiological variables of broilers grown to heavy weights. Poultry Science. Available at: http://dx.doi.org/10.3382/ps/ pev139. Accessed: June 19, 2015.